The limited information being released by Princeton on the objects being transferred to Italy is raising questions ("More on the Princeton Give-Backs: "Looting Matters" Digs for Provenance", CultureGrrl). Yesterday I drew attention to the three Apulian pots attributed to the Darius painter which will be returned to Italy from Boston, Malibu and Princeton. The three were significant because all had been listed as recent surfacings of the "painter's" work in Boston's catalogue of South Italian pottery. But I did not mention the Apulian dinos, also attributed to the Darius painter, which had been returned from the Metropolitan Museum of Art in New York (inv. 1984.11.7). The piece, showing Herakles and Busiris, was a purchase from "The Bothmer Purchase Fund, Rogers Fund, and Norbert Schimmel and Helen H. Mertens Gifts, 1984; Anonymous Gift, 1989" [see press release]. The piece was apparently identified by Polaroids seized during a police raid in Geneva (see Elisabetta Povoledo and Randy Kennedy, "Confrontation With Italy Looms at the Met", New York Times November 21, 2005). 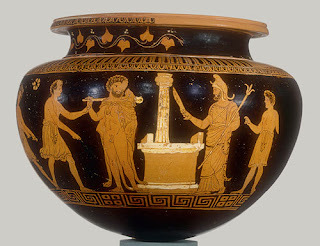 Nor did I note that a volute-krater, attributed to the same painter, in the Cleveland Museum of Art (inv. 1988.41) is also apparently under suspicion (Suzan Mazur, "Italy Will Contest Medea Vase At Cleveland Museum", Scoop.co.nz, October 9, 2006). What these pots appear to indicate is that there was a brisk movement of Apulian pottery from previously undisturbed tombs in Southern Italy to North American institutions. And the details of the transactions are beginning to emerge.